The other day I was backing up and leaving home when the steering wheel became impossible to manage so once I left and went a short distance and made a U-turn and came back home. There is fluid all over(power steering fluid? ?,but there is a lot). I don't have the money for a big repair so I haven't bothered looking under the hood. It's 12.5 years old and has approx. 43,000 miles on it and according to the dealer the power steering fluid is good to go for 100,000 miles. I was reading the other day that the Honda Civic was one of 25 cars that shouldn't be a problem making it to 250,000 miles. For now I can get by without a car(no longer work) so I can get anywhere nearby with a bus(only a dollar a day). All my doctor's are reasonably close except for one. So I could always switch and go to another heart specialist that's right down the street. Anyways it looks like it's going to be a large repair bill with the money not being there for the time being and was just wondering if anyone else has had this problem because it can only be a few different things and towing it wouldn't make sense because like I said more than likely the cash isn't there for a repair. It's could be the power steering rack which is somewhat costly. But, it also may not be that bad. It could just be a hose leaking. I would try to identify where the dripping/leaking is coming from and go from there. I would bet on a hose, as The Cow said. I'm basing that on the fact that you said there was fluid "all over". Generally if it was a "hard" part (e.g., power steering pump) it wouldn't spew fluid all over. Not to say that isn't possible though. As far as the 100,000 miles ... an average driver reaches 100,000 within five to six years. The fact that you have only put 43,000 on it in 12.5 years means the problems you see will not be the same as a normal driver. This also makes me think a hose ... something that eventually dries out, gets brittle, and cracks over time. This is exacerbated by the car sitting. If it is the hose that needs replacing about how much should that cost because it will need too be towed? It just seems like there is a lot of fluid and how much does the power steering fluid hold? If it is the return hose then it is $16 for a generic, but your shop may charge more. Labor will vary greatly, but i would guess around $50-150. You should look under the hood, if you can find the damaged hose then you can take a picture and send it to your mechanic for a quote. Fluid capacity is probably around 1-1.5 quarts. Exact capacity should be in your manual. 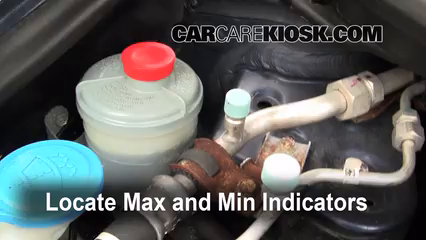 First look at your steering fluid reservoir to see if it's empty. It's on the passenger side under the hood. If the power steering fluid reservoir is empty, try refilling it. Put cardboard under the car in case you have a major leak. Check the hoses to see if one is leaking, has burst, or has popped off. Watch this video for how to find and open the reservoir. It sounds like you had a sudden failure, so you don't want to put sealer in the fluid like it talks about at the end.